The big question is, when you take a two-year break from blogging, what do you post? It has to be something amazing, right? Something you are known for by your family and friends. Is it bad that my mind went right to sangria? LOL What can I say, I have a busy life and this girl loves her wine. One of my favorite things to do on the weekend is have friends over for a relaxing dinner where we can all just sit around and laugh over our crazy lives and yes, wine is almost always involved. Many of my friends have come to know me for my sangria. I make a bomb sangria and it is so easy! So here you have it folks, the Diva’s go to sangria recipe. And guess what, I have one for each season. Here is my summer one if you want to take a peek at that. Note: I like to let my sangria sit in the fridge for a couple of hours with the fruit. It really allows the sangria to take on some nice flavors from the fruit and allows the fruit to soak up some of the boozy goodness. In a large pitcher mix together the wine, brandy, orange juice, and sugar until the sugar is dissolved. Add in the majority of your prepared fruit. (Set some aside for a nice garnish). Add in the 12 oz can of soda right before serving. So I have this incredible friend named Brandy. We have many things in common. One of which is our fabulous taste in refreshing adult beverages. A few weeks back I was at her home for a summer birthday party, and she made this white wine sangria. It was incredible! I would define it as being the perfect summer drink. I have had red sangria before but found it to be a bit heavy for a warm summer day. (I’m more of a white wine gal anyways.) This could not be further from the traditional sangria. It is light and super refreshing. I decided to make Brandy’s recipe for 4th of July for my aunt who says she doesn’t like sangria. (She had a bad experience.) Well guess what, my aunt could not get enough. Who am I kidding? No one could get enough! We had the pitcher wiped out within an hour. It could have been the 100º+ day that had us drinking glasses hand over fist, but either way every drop was enjoyed. 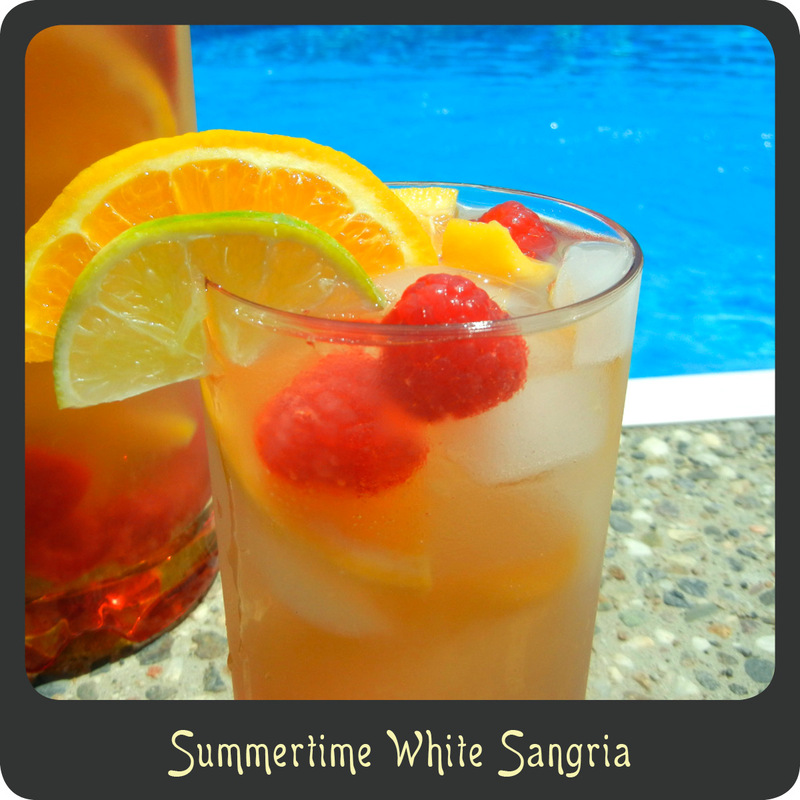 This is the perfect drink for a summer party or just a lazy day by the pool. And don’t forget to eat the fruit. That is one of the best parts! Gotta get in your vitamins. In a large pitcher combine together the wine, peach schnapps, and all the fruit. Add the ginger ale to the pitcher right before serving. Top off the pitcher with ice.